The legacy AAV-7 amphibious assault vehicle is very, very long in the tooth, having entered service in the 1960s. Even though it has gone through two major revisions, it is undoubtedly due for replacement. It is an excellent swimmer, but not so great ashore. But that’s the challenge with any amphibious vehicle- balancing the performance afloat, where you spend about 1% of your time, with performance ashore, where you actually do the fighting. But if you can’t swim well, then what is the point? Unfortunately, these two requirements tend to compete against one another. 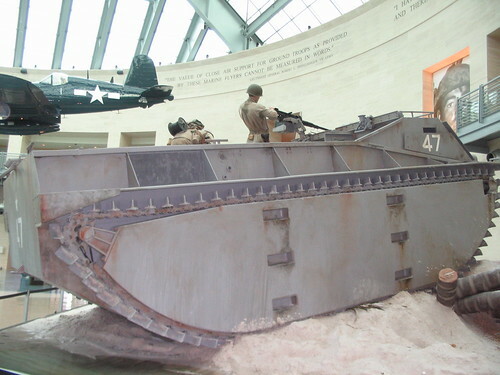 After the expensive and technically ambitious but frustrating development of the Expeditionary Fighting Vehicle was cancelled, the Marines eventually asked for proposals for a low end amphibious vehicle capable of carrying 11 troops, and incorporating lessons learned about protection against IEDs learned in Iraq and Afghanistan. Five teams submitted proposals, and the Marines expect to downselect to two teams shortly. Those two teams will provide 16 vehicles each that will then undergo about 2 years of engineering and operational testing. Megan Eckstein at USNI News has a piece comparing the five entrants. I’m leaning toward the BAE systems variant myself, but of course, Lockheed Martin will use its en0rmous political influence to try to win. BAE Systems and Iveco Defense partnered to create this entrant for the Marines ACV 1.1 competition. Photo courtesy BAE Systems. Lockheed Martin’s ACV 1.1 prototype. Photo courtesy Lockheed Martin. So, Chile is buying surplus AAV-7 amphibious vehicles. They’re only buying a dozen, so it’s not a major lift capability. Of the dozen, only 10 are troop carriers, so that gives them a lift of about 250 troops. Finally. I understand that complex systems take a long time to introduce into service, but this is surprising. The F-35A has launched its first powered missile launch. Mind you, this wasn’t even a full up guided shot. It was just to prove ejection and ignition. But the program will totally be fielding a combat capable squadron in three short years. Honest! While I think the multitude of camouflage patterns in the military is silly, I also think this bill is silly. I can think of a lot of other areas to save money. Heck, I have strong suspicion that compliance with this bill would end up costing just as much as no bill at all. New ship names released. Incredibly, no activist/victim of the month names were used. And URR, just be glad Burlington went to an HSV, not an LCS. Will Fort Carson shrink or grow? I don’t know. There’s a strong push to consolidate as many combat brigades as possible onto as few posts as possible. But the problem there is that each post has a finite amount of range and training area available. There is always a great demand for that range space. Ft. Carson isn’t an especially large post, but it does have relatively easy access to Pinon Canyon Maneuver Area, which has been expanding in recent years, and is one of the largest training areas available to the Army. After discussing the landings on Kwajalien yesterday, seemed fitting to post a few pictures from a recent visit to the National Museum of the Marine Corps just outside Quantico, Virginia. 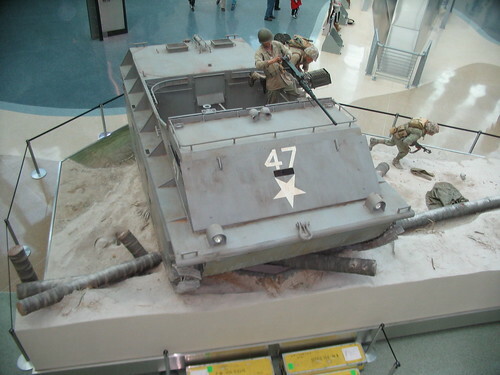 This rather dramatic exhibit features an LVT-1 as used in the landings on Guadalcanal and Tarawa (I don’t think they were used after that battle, correct me if I’m wrong). For the benefit of those not familiar with the LVT story, this vehicle came not from a formal military development project, but from a civilian need to traverse the Florida Keys. 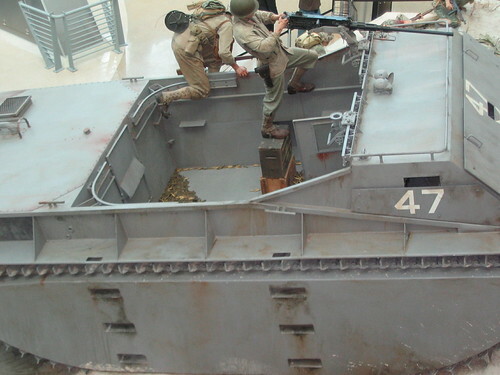 Instead of storming hostile shores, the “Alligator” was to rescue those stranded by hurricanes. When Marine officers saw Donald Roebling‘s creation in magazines, they saw other applications for the amphibious vehicle. The innovative tracks were a feature of the design. Notice there is not a “shoe” as on most tracked vehicles. Instead there is a chain, similar to that on a bike, running around the (unsprung) road wheels, idler and drive sprocket. But I’d bet you are fixed upon those “paddles.” Instead of some prop assembly with its own transmission drive, Roebling opted to let the track motion propel the vehicle in water. Worked good, except when moving on hard surfaces beyond the beach. Later versions of the LVT improved the tracks, offered spring suspension, and provided better mobility. The passenger compartment of the LVT-1 showed the civilian roots of the LVT. 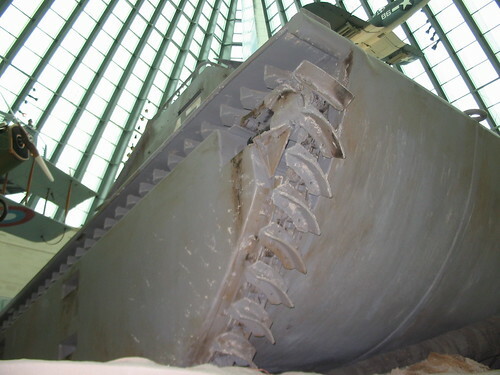 The amphibian carried 18 men or 2.5 tons of cargo. Marines exited the vehicle by going out over the sides (see the foot holds down the side). While the driver and co-driver had shutters, the vehicle lacked armor. Note also the ersatz gun mount. The gunner stands upon an ammo can in order to fire that .50-cal! And spent casings on the floor! And did I say dramatic? Sort of makes you want to get off the beach, don’t it? 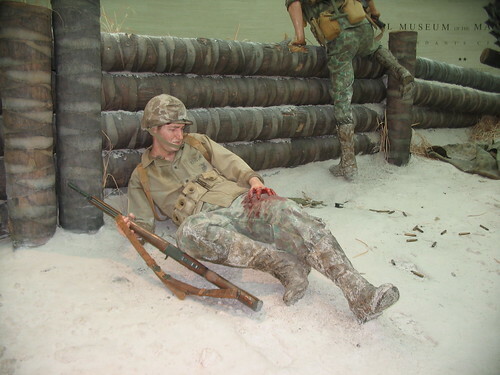 Reminds me of this wartime photo from Tarawa. I wanted to yell “Medic!” when I saw this guy. Overall a very well done display. If in the Washington, DC area, a visit to the National Museum of the Marine Corps is worth a stop. Fascinating exhibits at every turn. For those interested, I did a piece on the Civil War exhibits in the museum last month.